The fifty states that make up the U.S. are different in so many ways that they sometimes seem like different countries. These differences are most clearly seen in how residents of New York, Mississippi, Utah, North Dakota, and all the others spend their hours in the day. Indeed, the amount of time we spend on activities say so much about our interests and values. The American Time Use Survey, conducted by the Bureau of Labor Statistics, measured the amount to time Americans spent on different activities and compiled averages for each state. 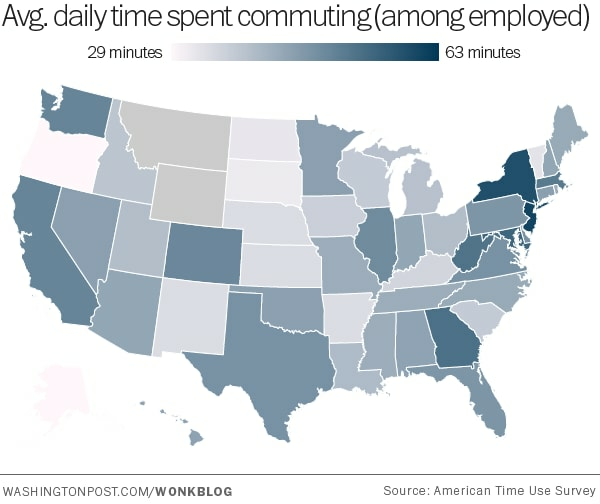 How long do we spend commuting to work? Reading? On religious activities? The Survey answered these and many other questions to give us a deeper understanding of how habits vary across states. And the Washington Post’s Wonkblog took it one step further by translating the data into maps, which you can find here: 10 Maps That Show How Much Time Americans Spend Grooming, Eating, Thinking and Praying. We can glean a few interesting conclusions from these. It’s not much surprise that New Yorkers and New Jerseyans have long commutes into NYC. 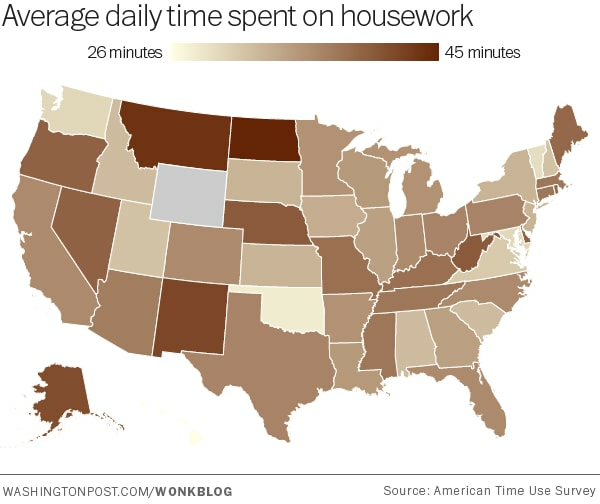 But did you know that North Dakotans apparently really like to clean? 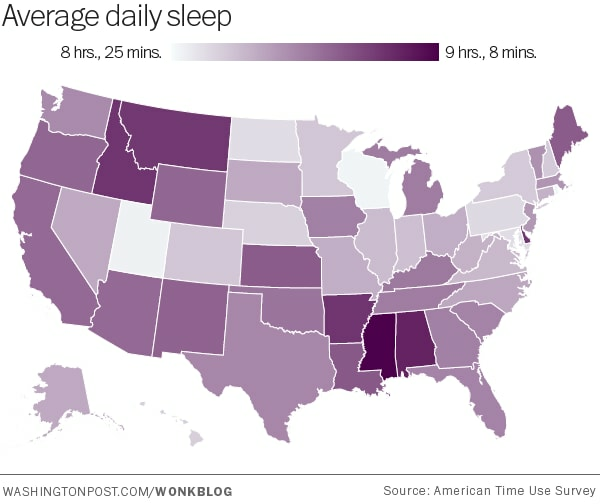 And Mississippians somehow get an average of 9 hours of sleep? The other maps on the post reveal that West Virginians watch the most TV on average, and folks in Louisiana spend the most time thinking and relaxing. Vermonters also spend the least amount of time grooming. Sadly, my home state of Connecticut is not very distinctive on any of these maps, appearing towards the middle on all measures. But perhaps that just means we’re really good at balancing our time. A Game of Thrones Conundrum: Should you Read the Books after Watching the TV Show? Popular books are often adapted into movies and TV shows, but rarely are movies and shows turned into books. Consumers typically move in the same direction– It is much more common for people to read the book before rather than after seeing its film or TV adaptation. But is this necessarily the best way to enjoy a story? What if, in fact, there are benefits to reading a book after watching the movie or show? This question came to me this past week after watching the Season Four finale of Game of Thrones. (Don’t worry, no spoilers ahead.) It was a riveting season, filled with murders, deceptions, and mysterious magic. The end of the season left me wanting more, and aggrieved at having to wait ten months for the next season to start. I do not feel ready to say goodbye to the terrifying yet intoxicating world of Westeros just yet. At the same time, I began to realize, from snippets in various pieces of internet commentary, that I had only really seen part of the story, for the simple reason that I have not yet read any of the books upon which the show is based. Despite their long length, these books have thousands of dedicated fans, some of them with busy lives, and many of whom can breeze through each of these books in a matter of days or weeks. Could the books be not as difficult as they seem? I definitely know the feeling of becoming so lost in a gripping story that the pages just fly by. Based on the volume of praise that I’ve seen for this series from critics and readers alike, this seems like the case with Martin’s prose as well. So let’s say I decided to read the books, and I had the time. The question then becomes: Since I already have seen the adaptations of the first three books on the small screen, is it worth it to go back and read them? Books can delve deeper than film into characters’ thoughts, feelings, and motivations. Rather than merely showing what happens, the words on a page work more seamlessly to guide you into a new world, bringing you inside someone’s head, and making you identify with a protagonist’s struggles. Well-chosen words can recreate a fantastical setting in vivid detail in the reader’s imagination and convey the exact blend of emotions the author hopes to elicit. A movie or TV show can certainly immerse the viewer as well, but a book allows you to linger longer and ponder further as you move through the story at your own pace. Once you have already seen the story on film, going back to the book is not at all the same experience. Rather, it is an opportunity to engage more deeply with the material and gain greater insight into the characters. The plot may have been spoiled for you, but I think you can still appreciate it anew, from a different perspective. In the ASoIaF books, for example, each chapter is told from the point of view of a different character, which intrigues me very much. On the show, each character is followed in their own storylines, but we never really know what’s going on in their heads. Books also have more time to tell a story and pursue various side plots which are not exactly relevant to the main storyline. Many times, these plots have to be removed from the adaptation to cut down the running time, and although the editing might create a more focused product, it can be disappointing for fans who want to see more. The problem is that movies generally have to keep it to two hours, and books, especially epic fantasy novels, take much longer to be told in full. Each season of Game of Thrones is 10 hours in length, and even then, book readers howl about plotlines and characters getting cut. This is one of the reasons I want to read the books, to see what other plots I’ve been missing, and to avoid worrying about spoilers from book readers. It makes sense to cut out the less important material for the show, especially because they are trying to reach a mass audience, but I also wonder why the season must be limited to ten hours. After all, HBO does not follow the normal conventions of TV, and if they wanted to air 20 hours per season, they could. Then again, even with all the time in the world to reproduce the entire canon of the books, it might not necessarily be a good thing to do so. After all, TV shows and books have different missions and rhythms, and show watchers who want to know more about Westeros can always dive into the books for all the parts of the story they’ve missed. For people who have read a book before watching the movie or TV show, a common reaction is disappointment. “How could they leave that part out?”, “Why did they change this?”, “I didn’t picture her looking like THAT!”, etc. Bookreaders go into the theater with an image of the story already in their minds, and they are bound to be let down. Now imagine doing the reverse. You’ve seen the movie or show, you know how the characters look, you’ve seen the loud explosions, the dragons, the tears running down cheeks. And you know the story, but probably not the full story. Now when you pick up the book, you can picture what’s happening more easily, learn new things about the story, and get a fuller understanding of the characters. Sounds like it could work, eh? Has anyone tried reading the book second? I have, sort of, but my memory of the movie adaptation was not fresh in my mind. I read Fear and Loathing in Las Vegas several years after watching the movie, and I definitely got a lot more out of it. To my teenage mind, the movie seemed like a black comedy about eccentric people acting silly on drugs, but the book had a much deeper recurrent theme about disillusionment with the idealism of the 1960s. Had this failed to translate to the movie, or did I just fail to pick up on it? Either way, I did feel that my reading of the book was enhanced by having seen the movie first. This makes me wonder what other kinds of themes and messages I may be missing from other books that I skipped in lieu of watching the movie. In conclusion, I think it could be worth it to read A Song of Ice and Fire for curious fans of the TV series who are itching for more. And I also think I may have just talked myself into a 4,272 page summer project. Until next time… Keep reading, keep mapping! This past week, accomplished designer Massimo Vignelli passed away at the age of 83. Among his diverse accomplishments, his most well-known is probably the 1972 map of the New York City subway system. It was a radical departure from previous designs, and attracted a great deal of controversy. After only 7 years, it was discontinued and replaced by a different design. It is still remembered, though, as an example of modernist design and shown at the Museum of Modern Art in New York. Perhaps it also an example of how big changes in cartographic design can incite intense backlash, especially when the subject in question is a space as public and personal as the New York City subway system. Vignelli’s design is a little jarring to our eyes. He set out to make it easier for riders to see the stops on the subway lines, with straighter routes and bigger fonts. But he also made some huge changes that are disorienting to people who were used to seeing things a certain way. For one thing, he did not use green for parks and blue for water, as we are accustomed to seeing. Rather, he drew parks like grey blobs and used a bland tan-like color for rivers and ocean. Secondly, he distorted the shape of the city and its above-ground features. Central Park, for example, looks more like a square than a tall rectangle on Vignelli’s map. 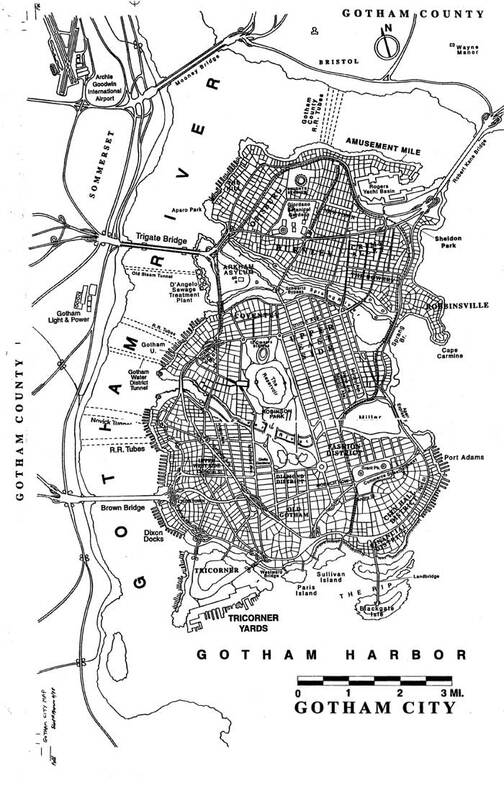 The whole island of Manhattan has lost its distinctive shape and taken a simplified angular shape. In essence, the city has lost its New York feel, and has become more of a Platonic form of itself. The design was scrapped in 1979, seeming to confirm that modernist design and subway maps do not mix (at least not in New York City). 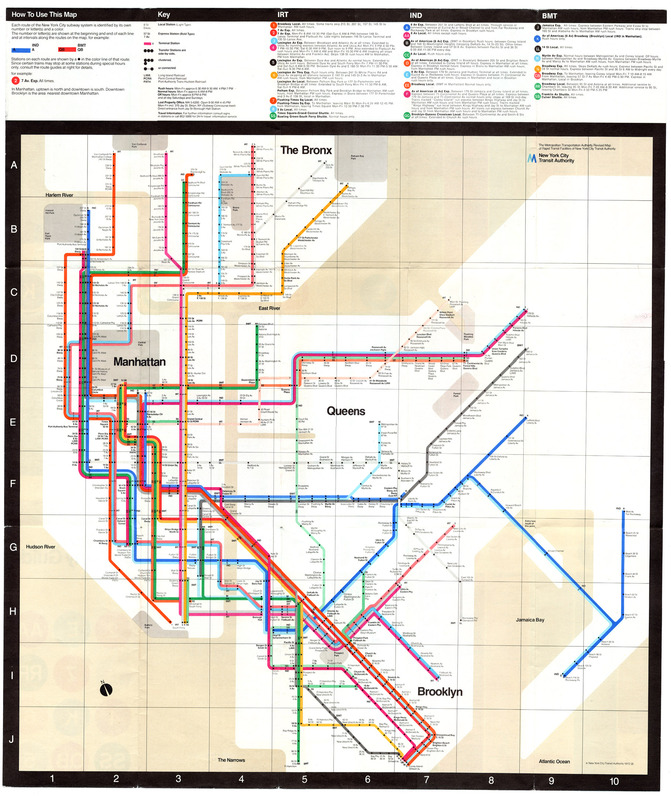 The largely negative response to Vignelli’s map showed that it does not matter if the subway lines are easier to read if the larger geography is too abstract and non-intuitive. Subway riders like to be able to glance at a map and immediately locate themselves to find their way. Unfamiliar color schemes and shapes only hinder that process. The Vignelli map does live on in digital form, though. It was recently used as the basis for the online weekend subway service map called The Weekender, which is also available as an app for iOS and Android. It is faithful to Vignelli’s spirit, but somehow the color scheme is even less obvious than before (white is land, grey is water). But perhaps in the age of apps, it does not matter anymore how the surrounding geography appears, as long as riders are efficiently directed from one station to the next.